Marg and I have been steadily working away making wheelchair quilts. This is one top that is now complete. Deciding on the pattern was the easiest so far in the history of us making quilts. Marg happened to be perusing a quilt book of miniatures or something and we saw this and it was like a 'eureka' moment. The original had more blocks and one more row but that gave us the idea. We are trying to use up the fabrics we have and so this is what we came up with. This is the top we are working on at the moment. One of the guilds I belong to had some kits to be sewn up into lap quilts and I picked one up. This was a couple of years ago and I remembered how easy the pattern was. The one I had put together was prints of blue with a white solid. When it came time to make another wheelchair quilt, I remembered this pattern but didn't know the dimensions. I knew that it was a square when finished and so, if the print in the middle was an 8.5" X 4.5" and the solid sashing strips were 8.5" X 2.5", then once the pieces were sewn, it would make an 8.5" square. That's it for the Champagne Quilters. 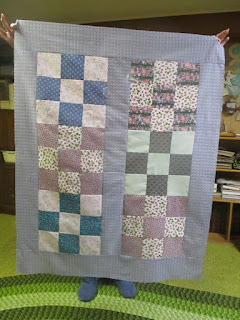 If someone has any suggestions for easy quilts, let me know. We are always on the look-out for fast, easy scrap quilt patterns. quick to sew together, and bright purple, that would give anyone in a wheelchair a huge smile as it tucked round so warmly. 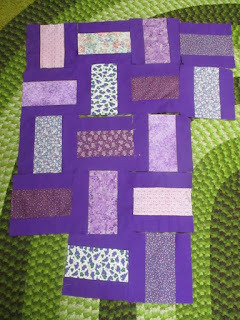 I"m sure your quilts are loved by the recipients and they feel the love that went into the making of them. 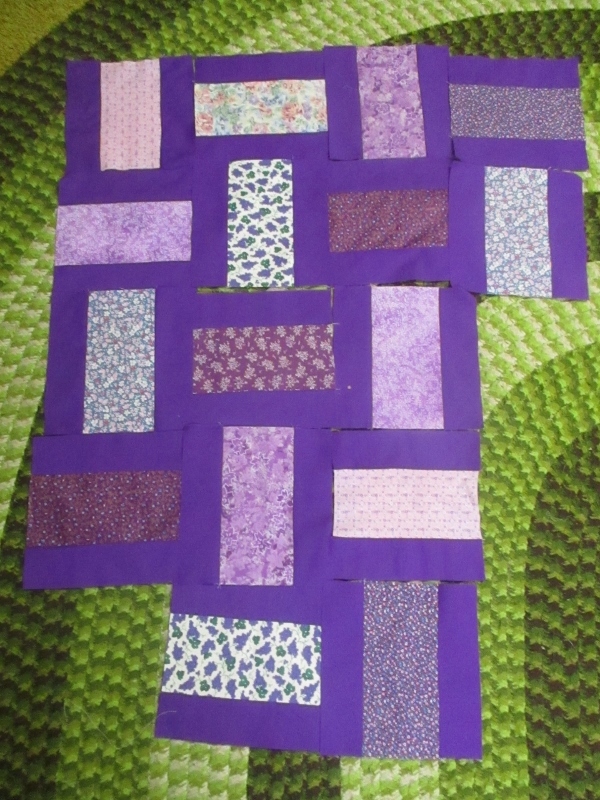 This will be a beautiful quilt for an elegant elderly lady!